The Samsung Galaxy Note 9 is surely going to be one of the best Android phones of this year, and in case you still don’t know, the announcement will take place on August 9 at the Unpacked event. Samsung likes to launch its Note series phones in some gorgeous colors, and the Note 9 isn’t going to be an exception. Today, the images from the well-known tipster, Evan Blass, revealed the three beautiful colors that the Note 8 is coming in. So, we have the Galaxy Note 9 in Black, Blue, and Brown. It is not yet confirmed if there are some more color options, but Samsung likes to keep launching new color variants of its flagships. It looks like we aren’t going to see any Purple color options this time with the Note 9 as we have the all-new Brown color option. It may seem a weird choice, but it is not the first time we will se having a phone with Brown paint job. We have seen this color options with phones like the Huawei Mate 10. One thing that you will notice instantly after seeing the image above is that the Blue variant has a Yellow S-Pen while the other two variants have S-Pen in the same color as the phone itself. Well, we don’t want to talk about the design as we already know how the phone looks like. Also, the specifications will remain mostly unchanged from the Galaxy S9+. There are some new features in the S-Pen, however. 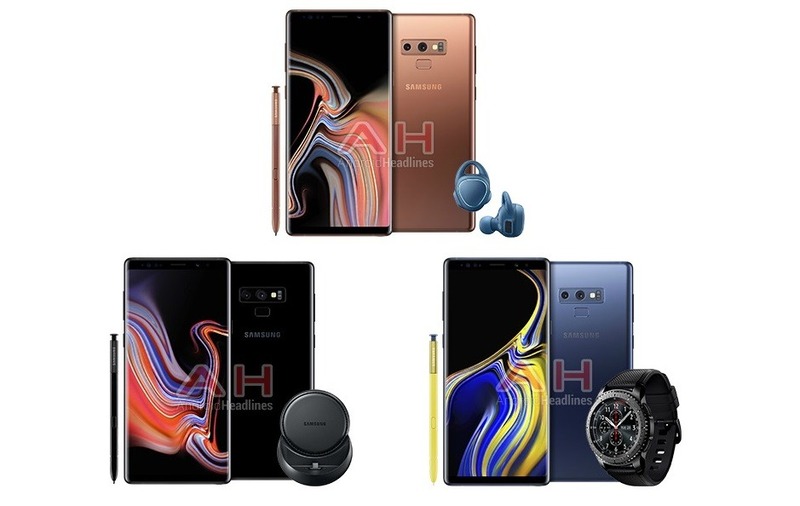 AndroidHeadlines too got some official renders of the Samsung Galaxy Note 9 along with the various accessories that will be announced at the event. These include the earbuds, smartwatch and the charger. So, what are your expectations with the Samsung Galaxy Note 9? Do let us know via the comments section.